It is an open secret that Pakistan and the USA share a very complicated relationship. While people in Pakistan perceive the USA as the World’s bully, an Israeli ally, an Indian partner, a ‘fair weather friend’ or even a frenemy, Americans perceive Pakistan as the hot bed of fanaticism, untrustworthy, complicated, the birthplace of Islamic fundamentalism and the launch pad of terrorism worldwide. However, the bottom line is that both need each other because their interests are intertwined. Pakistan needs economic assistance for its much-battered economy, a consequence of entering the ‘war on terror’. Pakistan also needs the USA to meet their security needs vis-à-vis their larger neighbor India. Similarly the USA also needs Pakistan to maintain access to Afghanistan and further to the mineral rich states of Central Asia. Besides, the USA needs to keep Pakistan engaged to maintain security in its own homeland. After all it was the follies of these two allies that gave birth to the ancestors of the Taliban and Al Qaeda in the Afghan Jehad of the 1980s, then affably known as the ‘Mujahiddin’. Despite the entire riposte by their respective security analysts and armchair alarmist, the bottom line is that the people of both these countries share the same human instincts primarily in social values, religious conservatism and a common desire to live in harmony, to provide a good life for their families through a decent livelihood; a life free from terror, fear and the danger of meeting an unnatural end. Sixty-four years into her existence and the Pakistani nation is facing identity crises. The voice of the innocent, peace loving and progressive masses has been subdued by a vocal, fanatic, determined, but small minority who otherwise make the bulk of the news from Pakistan; thus signaling a skewed perception of the country to the world. But they have their reasons. This novel attempts to understand different perceptions that have become extremely deceptive over time. This story attempts to understand different views on sincerity, friendship and loyalty. It is an attempt to recognize that while we all have a common goal we need to reach that goal via mutually acceptable means. ‘The Misunderstood Ally’ may be a novel but the environment it reflects is real. It’s characters may not be original but the personas they represent are real. The events may not be precise but the motives behind their occurrences are real. The story may not have all the solutions but can help to make the reader understand all the perspectives. So let us understand these perspectives and join our hands together to make this world a better place, where people from all over the world can live a decent life; a life with our loved ones in peace and tranquility. Dhil, 41, is a pure Commando in form. Strong, well built with deep brown intense eyes, thick black moustache cutting across a hardy facial structure; good looks are now a thing of the past. In fact his current demeanor reflects years of robust lifestyle half of which has been spent in challenging terrains undertaking death-defying missions all in the name of performing his duties for his country. Conscientiously following the Commando tradition of leading his men from the front this almost 2 meter tall Commander stands out among his subordinates acting as their beacon of success thereby enjoying their trust, respect and loyalty. Such is the effect of his commanding personality that his men’s morale is boosted at the mere sight of him and who are then ready to follow him even in the most difficult of missions. Despite such a strong exterior he still has the heart of a child who needs to confide in a loved one. Who needs to be cajoled and caressed from time to time for him to gain his motivation and encouragement in undertaking his duties. While the men of his Battalion come up to him for their morale boosting, he seeks his emotional support from his wife Rania, whom he lovingly calls ‘Rani’ meaning ‘Queen’ of his heart. Mullah Baaz Jan, who claims to have counted thirty-six winters from the time he learned to count, has been fighting one enemy or the other since he was an adolescent. Son of a Mujahid (2) his early childhood memories were of his father bearded, with a traditional meter long cloth wrapped around his head, carrying a Kalashnikov assault rifle and bullet belts strapped across his body, heading out on fighting expeditions against the Soviet Army in Khost province of Afghanistan. ‘Son, you are now the guardian of your mother and siblings and custodian of your motherland. Since centuries we have defended our homeland from foreign invaders be it the British Empire or the Soviet Army. I entrust you to carry on the family legacy of defending your honor, your family and your country. Remember guard your homeland till the last drop of your blood. Prefer death to Dishonor. May Allah be with you’. These parting words have been resonating in Baaz’s mind for the past 27 years and have charted the course of his life. Just like his father fought the Soviets he feels it his moral duty to fight off the Americans who have now invaded his country, hence honoring his dying father’s last wish. Special Agent Samantha Albright, 34, is engrossed in conducting a Drone Operation over the Af-Pak border area. The target is the Leadership of LaM and Al Qaeda reported to have gathered in the Union Mosque. Samantha Albright, code named ‘Sam’, is single but claims to be married to her job and country. Belonging to the mid-Eastern State of Arkansas, patriotism runs in her blood. Her family heritage has been to protect America from her enemies. Her grandfather was a soldier of 101 Airborne Brigade in WWII, whereas her father was a Vietnam Veteran. Her prime objective is to continue the family tradition of making America a safe place to live, free from any fear or terror. She just cannot see her country held hostage by anyone else in the world. Her cold-blooded emotions and motivation to conduct any operation without giving it a second thought makes her an ideal candidate for her present assignment. However, covering such a torrent of emotions is an attractive façade. She catches the fancy of her male counterparts who although are enamored by her chiseled features, auburn wavy tresses, supported by a statuesque figure, more an outcome of rigorous exercise and disciplined routine rather than any beauty regimen, are afraid to seek her out due to her fiery temper which has given her the nick name of ‘Balls Buster’. In fact it is because of this that she has not maintained a steady long-term relationship in her life. She graduated from Harvard University with a Degree in Law and International Relations just after 9/11 but instead of continuing a career in the same field opted to join the CIA with the desire to follow in her ancestors’ footsteps. Today is an important day for her and she wants to make sure that the mission is a success. World is in the grip of “War on Terror”. Reprisal threats from indigenous forces resisting foreign presence in Afghanistan have made the developed countries wary of extremism in the Muslim world; bringing Islam in clash with the West. USA, the sole super power and leader of the free world and Pakistan, the sole Muslim nuclear power and teetering citadel of Islam; are two countries on the different edges of this conundrum but their intertwined interests have brought them into an uneasy alliance against the radical forces rising from Afghanistan. As fanatics threaten revenge attacks on American soil, a gutsy and determined Special Agent, Samantha Albright, lands in the hornet’s nest. As violent suicide bombings increase in Pakistan, a brave and patriotic Army Officer, Lt. Col. Dhilawar Jahangiri, grapples between his personal challenges and call of duty. As CIA initiates independent anti terror operations at Af Pak border, a ruthless and belligerent militant commander, Baaz Jan, fights back for what he feels is right. In a volatile environment where all forces fight for supremacy, three individuals persevere in their beliefs, embarking on a dauntless journey of valor, sacrifice and self discovery”. I’d also like to share with you an interesting conversation that ensues between Sam and some other characters in the story. This excerpt would be of particular interest to you since we all have Air Force background. By the way this part like the rest of the novel has been thoroughly researched first. …….As she gasps for breath trying to lower her temper, Khalid pauses for a while and then softly responds. “Sam, I've been a combat pilot myself having flown thousands of hours on fighter bombers in which I've made countless bombing runs as part of my training. I'm also now an airline pilot flying the same Boeings that were flown into those Twin Towers. You ask any pilot and he'll tell you that it takes hours and hours of actual flying and formal conversion courses to successfully fly those planes and then hours and hours of training to successfully take those planes into their intended targets. The margin of error is so little at that high speed and low altitude that I feel it could not be done by some rookies who were also busy hijacking the planes at the same time”. This novel is full of such incidents where characters clash with each other trying to justify their positions as story unfolds. In my novel, nobody would be right or wrong, hero or villain. The three aforementioned protagonists along with other support characters will get to present their points of view as the plot unveils and it’ll be for the reader to finally decide who is right and who is wrong. There is also action, thrill and drama in the novel depicting various events as the plot unfolds. “Faraz Inam is a corporate banker by profession. After a brief stay in the Pakistan Air Force he opted to continue his career in civilian life, obtaining an MBA degree from the prestigious Lahore University of Management Sciences (LUMS) in the process. Having played major roles in two blockbuster television series in Pakistan in the 90s, Faraz now leads a humble life while working for a bank based in the United Arab Emirates. He currently resides in Dubai with his wife and three children. 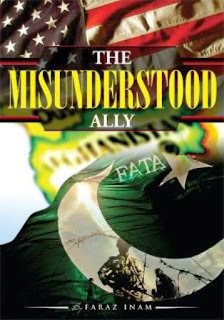 The Misunderstood Ally is his debut novel”. Wanting to play my little part in this struggle to keep our country’s name high, I embarked on writing this novel on the current state of affairs in Pakistan and our part in the ‘war on terror’. I’ve been related to military since childhood one way or the other; son of a PAF Officer, an ex-Cadet of PAF myself, having projected the Army on media through two drama series and maintaining contacts with my numerous course-mates in the military; I believe gave me sufficient knowledge and motivation to initiate this project. Once upon a time we were privileged to have barristers and lawyers like Justice M.R Kayani, Justice A.R Cornelius, Justice Dorab Patel and Mohammed Ali Jinnah- men who were the very embodiment of brilliance, hard work and gravitas. They were circumspect in their personal as well as public dealings and were a credit to the nation. Now our icons of the past must be turning in their graves at the unsightly spectacle of furious lawyers attacking and ransacking Judge Pervez Ali Shah’s courtroom in Rawalpindi because of their opposition to the death penalty handed down to Salman Taseer’s assassin Mumtaz Qadri. Aside from the religious sentiments being provoked of such ‘Aashiq e Rasool’ (lovers of the Prophet) amongst the legal fraternity, this situation begs the question: if lawyers themselves do not respect judicial verdicts, then who will? Are they not bound by the tenets of their profession to pay heed to court decisions? Surely, discipline and dignity are the two essential pillars upholding a major state institution like the judiciary. Far from being censured and suspended for their ridiculous behaviour, the District Bar Association has asked for Judge Pervez Ali Shah’s transfer because “it can create a law and order situation.” Lawyer Farooq Sulehria has proclaimed that lawyers would boycott Shah’s court because of the “unacceptable” sentencing. Based on TV interviews and statements, it has been established time and again that Salman Taseer did not say anything against the Prophet (pbuh), but in fact he said he respected the Prophet like all Muslims. Taseer expressed support for blasphemy convict Asiya Bibi and opposed the implementation of the blasphemy law since the majority of the cases so far have been motivated by enmity. Hence, Mumtaz Qadri’s justification of blasphemy for murdering the late governor in cold blood does not stand in court. How low lawyers can stoop to grind their own axes was visible during the case when Salman Taseer was subjected to a disgraceful character assassination because the case for the defence was so weak. What do a man’s marriages or lifestyle have to do with his murder? Naturally, members of religious parties have been hailing Qadri as their hero at massive rallies, because they are indoctrinated, immune to logic and after all this is their bread and butter. But since when have lawyers joined these militants who have blood in their eyes and froth on their lips? In retrospect, there are bittersweet memories of the Lawyers Movement which galvanised Pakistan in 2009. These very same lawyers and their Chief Justice garnered support from almost all Pakistanis because people applauded the courage of one man to stand up to a system in front of which so many have caved in. Lawyers were garlanded and cheered as they marched for justice through the sweltering heat. When the Chief Justice was restored, there were celebrations galore and an overwhelming camaraderie brought on by “peoples’ power”. How ironic then that today when another brave man has stood up for truth and justice, he has been hounded out of office by his very own colleagues. Justice Pervez Ali Shah saw the frenzy of the religious right every day during the closed door hearing in the high security Adiyala prison as trucks of supporters shouted full throated slogans and embraced Qadri. The judge knew there would be hell to pay if he did not release Qadri. Yet he upheld the dignity of his office by giving the right verdict: guilty as charged. How ironic then that instead of supporting their valiant colleague, lawyers are showering rose petals on Qadri and kicking apart Shah’s courtroom. It beggars the mind that things in Pakistan have come to such a sorry pass. Increasingly, it seems that it is no longer a country for sane men. Even the cleric who led Salman Taseer’s funeral prayers has been forced to flee the country after constant threats to his life. Taseer’s son, Shahbaz, who appeared in court for the prosecution, has been missing for more than a month and there are reports of his release being sought in exchange for freedom for Qadri. Who then can blame the Taseer family for their guarded silence after the guilty verdict? When the death penalty was handed down in the Sialkot lynching case, it seemed like a ray of light on the dark horizon and justice for the bereaved family of Muneeb and Mughees. One was jolted back to grim reality when the main culprit, SHO Rana Ilyas, who was filmed during the lynching, was given bail when he filed an appeal with the Lahore High Court. One may well ask whither justice then for the aggrieved in Pakistan? Another puzzling question is why do we express so much concern about the rights of Muslims in other countries, be it Palestine, Syria, Bahrain, Kashmir or India? How well are we treating our fellow Muslims in Pakistan? All one needs to ostracize, maim or kill another here is to have him or her declared an Ahmadi or a blasphemer or a member of a religious minority.. take your pick.. and self appointed standard bearers of Islam pop up like magic, wielding axes, guns and batons and hurling abuses. This vile madness is consuming us all and making us a stranger to one another. Our diversity should be our strength, not our weakness. To add to the maelstrom of disease, natural disaster, corruption and inertia devouring Pakistan, one can add that justice has also become a commodity to be bartered and many of it’s practitioners are truly a disgrace to the noble profession. To have dispensers of justice applauding murderers is truly the stuff of nightmares. REHMAN Malik is probably the most mobile and visible minister of the federal cabinet. He has been bravely at the centre of several odd situations, mostly relating to terrorism. Yet he has found the time to help his government and party cut crucial political deals. All his efforts had until now gone unrewarded by the public; instead, he had drawn the wrath of his detractors for his alleged inability to perform his duties as interior minister. In recent times, doubts had been cast over his role with regard to the violence in Karachi. Against this background, a beaming Mr Malik receiving an honorary doctorate from none other than the Karachi University on Tuesday makes so much sense. It signifies Karachi`s recognition of his services. The problem, a minor one, is that as a former intelligence man, Mr Malik appears to be permanently wedded to mystery wherever he goes. In this particular instance, members of KU`s academic staff have been left searching for clues to the interior minister`s qualification for the doctorate. The award has come at a time when the term of the current vice chancellor of the university is about to end. It is the Sindh governor, who, as the chancellor of the university, has conferred the degree on Mr Malik, while, as per convention, it is the syndicate at an institute that nominates personalities deserving of such an honour. Then, if the doctorate has been awarded without consulting the syndicate or the academic council of the university, there may follow a debate about whether this is against the basic idea of academic freedom. This last one is perhaps the most crucial of all questions and it will be in everyone`s interest that the responsibility for explaining the situation does not, once again, fall on the shoulders of Mr Malik.